• Law enforcement vehicles, fleet cars, rental vehicles, taxis, or vehicles that have been used for ride-share services: these should all be at the very bottom of your purchase list. Even if they appear to be in pretty good shape, they’ve most likely racked up an excessive amount of mileage—and were almost certainly operated under fairly harsh driving conditions. • Lemons: vehicles that have warranty-covered defects which cannot be repaired by the manufacturer within a certain time period, and after several attempts, are considered lemons in most states (though the requirements vary). Depending on location, if a manufacturer re-purchases a defective vehicle, the title must reflect that it is a lemon law buyback. Purchasing these cars is generally not advisable, since the manufacturer will have already made several attempts to rectify the problem before re-purchasing it from the owner. • Wrecked and repaired: if a car has been in a wreck, it may have sustained frame damage that could cause instability and issues in the future. If you’re interested in purchasing a vehicle that has been involved in a wreck, be sure to request the repair invoices/records to see what type of work has been completed. • Storm registry: some vehicles that have sustained flood damage are moved great distances in order to be sold in other areas where buyers might not be as well-versed in inspecting for water damage. The National Motor Vehicle Title Information System (NMVTIS) can help you research the background of your prospective new vehicle to make sure that the title isn’t missing any important information (but it’s still important to check for signs of water damage even if the title comes up clear). You’re ready to lay down some hard-earned cash—so take the time to evaluate your purchase. • Potentially stolen: if you have any suspicions that the used vehicle you’re interested in may have been stolen (some clues include if the VIN plate is missing/repainted, the VIN on the title doesn’t agree with the one on the body, or the vehicle is priced lower than its value), it’s best to just walk away. 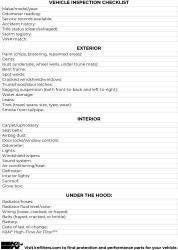 Arriving with a checklist can let prospective sellers know that you’re serious about fully evaluating the vehicle—and can help you reduce the buying price if you locate areas that need repair. Circle the car and try to look from every angle. Are there any ripples in the body that might indicate damage? Is the paintjob in good shape? Look carefully along the body at an angle—instead of straight on—to see if you can catch any dings or paint cover-ups in the reflection. 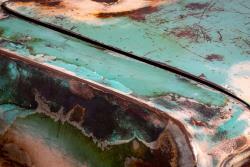 Corrosion is serious—and it will only get worse. Severe dents and chipped paint can be expensive repairs. 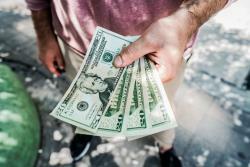 If the seller hasn’t already discounted the price to account for the damage, make sure the proper deductions are made. If you notice areas that have been re-painted, it should tip you off that the vehicle may have been in an accident. Rust spreads—which is why it should always be immediately removed/repaired when noticed. Even if it is painted over, which some unscrupulous sellers will do, the surface beneath will continue to degrade. 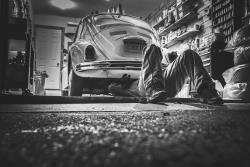 Don’t forget to look for rust on the underside of the car, in the wheel wells, and under the trunk mats. If you observe anything other than very mild rusting, it’s best to walk away. Salted roads can accelerate corrosion on the undercarriage of a vehicle, so bring a flashlight and make sure to get down on your hands and knees. If the vehicle has a brand-new undercoating, that may be a red flag that the seller is trying to hide corrosion. Spot welds and bent frames are signs of wreck repairs, and should be an immediate deal-breaker if not already disclosed by the seller. If a vehicle has been in an accident, door latches, hood latches, and trunk latches may be thrown out of alignment. This is also a good time to check the insides of doors and in the trunk for signs of repainting. 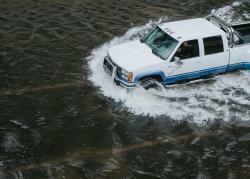 Always look for signs of water damage in any prospective used vehicle. The front and rear of the vehicle should be level when resting on a flat surface. If you see unevenness either front-to-back or left-to-right, it could be an indication that the suspension is damaged. If a car has been flooded out, you will typically be able to find water stains inside the trunk, under the seats, and under carpeting—and the car may have a musty smell. Move the vehicle from where it was parked, and check to see if there are any fresh leak spots. Tires should all be the same size and type; unmatched/unbalanced tires can negatively affect gas mileage and potentially cause premature wear. Look carefully at the treads—wear on the outside treads can indicate an alignment issue. Correcting front-end alignment is usually relatively inexpensive, but rear-end alignment issues could indicate a bent rear axle, which is an expensive repair. 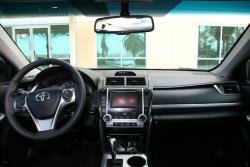 Make sure the condition of the interior approximately matches the number on the odometer. A pristine interior may or may not be important to you, but evaluate whether or not the interior wear matches up with the mileage number you’ve been given. If the steering wheel or other interior components are extremely worn, the odometer shouldn’t read at only 30,000 miles. Make sure you can find all of the back-seat belts, and that they are all operational. Check all of the seat belts to make sure they’re operational. If the vehicle has been in an accident that caused the airbags to deploy, you may be able to see trace residue of the airbag powder inside the interior. Check in places that are more difficult to clean—like under and between seats, under floormats, and around the steering column. Repairing these will require you to disassemble the door, which can be time consuming and potentially expensive. If the number seems too good to be true, it probably is. It’s possible to tamper with odometers, which is why it’s critically important to examine all of a car’s official records (and service providers often note the mileage on invoices, assuming you are given previous service records to peruse). Have someone stand outside the vehicle and see if the headlights, front and rear signals, fog lights, and high beams are all operational. This is also a good time to have a friend check to see if any smoke comes from the tailpipe while the engine is running. It’s never a bad idea to have a trusted mechanic evaluate your prospective purchase. Give all the controls a go, just to make sure you don’t have any surprises once the weather changes. Cracked and brittle hoses indicate the need for replacement. The fluid should be near the full line. If it’s clear, it is likely water—which is not a good sign that the car has been properly maintained. If you see oil floating on the surface of the fluid, a cylinder has likely cracked, and you’ll likely want to walk away from the purchase. Can you see anything loose, cracked, or frayed? 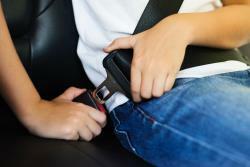 Frayed, cracked, or brittle belts should be replaced. This isn’t an extremely expensive repair, but cracked or brittle spark plug wires can potentially cause the engine to misfire. Corroded terminals indicate the need for a new battery. The seller may attempt to clean the battery before a sale, so check the battery cables too. Records of regular maintenance are a definite plus. If the car has a stock air filter, consider switching it out for a K&N High-Flow Air Filter™, which is washable, reusable, and designed to last for the lifespan of your vehicle. Before purchasing any used vehicle, it’s important to do a thorough inspection—and if possible, hire a trusted mechanic to do the inspection with you. Make sure to do a test drive (with the windows rolled down, and also up!) and listen for any strange noises or rattles. Check the brakes for screeching, and note whether the transmission moves smoothly between gears. If you do end up purchasing a used vehicle, make sure to invest in any necessary maintenance. We recommend immediately replacing your disposable air filter with a K&N® High-Flow Air Filter™, which provides your vehicle with exceptional engine protection and airflow. Feel free to print the complementary vehicle inspection checklist included above to help with your next used car purchase. Explore all of the products that K&N® has for your vehicle here, and join the millions of vehicle enthusiasts who trust K&N® to provide performance, protection, longevity, and clean air!